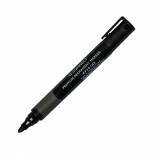 Black Permanent Bullet Tip Marker (Pack of 10) WX26045A Pack of 10 Permanent Markers. Low odour non-toxic markers with long lasting tips and suitable for use on practically any surface. The permanent ink dries quickly and is completely waterproof. Bullet Tip. Colour - Black. 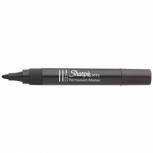 Sharpie Permanent Marker Fine Black (Pack of 12) S0810930 Pack of 12 Sharpie Marker. Pen style marker with a convenient pocket clip and quick drying permanent ink that writes on almost any dry surface. Fine nib gives 1.0mm line width. Colour - Black. 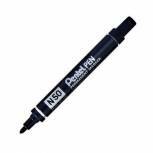 Pentel N50 Permanent Bullet Marker Broad Black (Pack of 12) N50-A Pack of 12 Pentel N50 Marker. Durable permanent bullet tip marker, suitable for almost any surface rough or smooth. Heavy duty, with a tough aluminium barrel, ideal for both industry and commerce. Produces a 1.5mm - 2mm line width. Colour - Black. Q-Connect Permanent Marker Pen Bullet Tip Black (Pack of 10) KF26045 Pack of 10 Q Connect Permanent Markers. Low odour non-toxic markers with long lasting tips and suitable for use on practically any surface. The permanent ink dries quickly and is completely waterproof. Bullet Tip. Colour - Black. 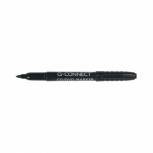 Q-Connect Permanent Marker Bullet Tip Fine Black (Pack of 10) KF02300 Pack of 10 Q-Connect Permanent Markers. Fine bullet tip. Waterproof. Ideal for marking a variety of surfaces. 1.0mm line width. Black. Pack of 10. Q-Connect Permanent Marker Pen Chisel Tip Black (Pack of 10) KF26042 Pack of 10 Q-Connect Permanent Markers. Low odour non-toxic markers with long lasting tips and suitable for use on practically any surface. The permanent ink dries quickly and is completely waterproof. Chisel Tip. Colour - Black. 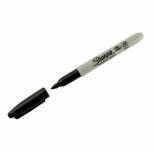 Sharpie Twin Tip Permanent Marker Black (Pack of 12) S0811100 Pack of 12 Sharpie Twin-Tip Marker. Permanent marker suitable for use on most hard surfaces. Features a standard, durable, fibre tip on one end and a ultra-fine tip on the other. Ink colour - Black. Q-Connect Permanent Marker Pen Bullet Tip Red (Pack of 10) KF26047 Pack of 10 Q-Connect Permanent Markers. Low odour non-toxic markers with long lasting tips and suitable for use on practically any surface. The permanent ink dries quickly and is completely waterproof. Bullet Tip. Colour - Red. 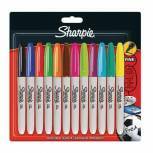 Sharpie Permanent Marker Fine Assorted (Pack of 12) 1986438 Pack of 12 Sharpie Markers are resistant to UV, water and abrasion making them ideal for writing neatly on a variety of surfaces. 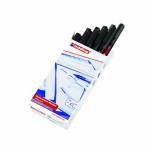 The pack of 12 contains assorted colours for precise writing. 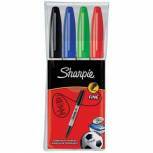 Sharpie Permanent Marker Fine Assorted (Pack of 4) S0810970 Pack of 1 Sharpie Fine Marker. Pen style marker with a convenient pocket clip and quick drying permanent ink that writes on almost any dry surface. Fine nib gives 1.0mm line width. Assorted wallet of 4. Pentel N60 Permanent Marker Chisel Tip Black (Pack of 12) N60-A Pack of 12 Pentel N60 Marker. Durable permanent chisel tip marker. Suitable for almost any surface rough or smooth. Heavy duty with a tough aluminium barrel ideal for both industry and commerce. Produces a 1.0 - 6.0mm line width. Colour - Black. 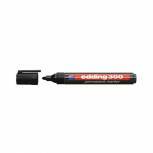 Edding 300 Permanent Bullet Tip Marker Black (Pack of 10) 300-001 Pack of 10 Bullet tip marker. Permanent. Tough acrylic tip. Large ink content and anti-roll cap to fit barrel. Stroke width 1.5-3.0mm. Colour - Black. 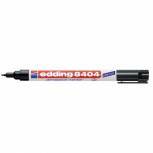 Edding 8404 Aerospace Permanent Marker Ultra Fine Black (Pack of 10) 8404-001 Pack of 10 Contains Black waterproof ink which conforms to EN71-3 and is light and water resistant once dry. Also resistant to many solvents and varnishes. 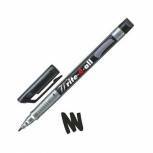 Stabilo Write-4-All Permanent Marker Fine Black (Pack of 10) 156/46 Pack of 10 Stabilo Write-4-All Fine Permanent Marker. Multipurpose pen that will write on any surface. 0.7mm tip. Ink - Black. Pack of 10. Q-Connect Premium Permanent Marker Pen Bullet Tip Black (Pack of 10) KF26105 Pack of 10 Q-Connect premium permanent marker bullet tip. A good quality premium marker with a rubber grip for easier handling. Contains 5g of ink to give a writing length of 350m. Waterproof cap off time at least 24 hours. Stroke width 2-3mm. Colour: Black. Staedtler Lumocolour CD/DVD Marker Pen Fine Black (Pack of 10) 310CDS9 Pack of 10 Staedtler Lumocolour CD/DVD Black Marker. 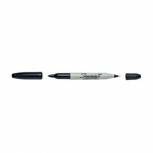 Permanent markers with an extra soft tip that does not damage or penetrate sensitive CD/DVD surfaces. 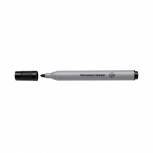 Features dry safe ink with excellent smudge proof and waterproof qualities. Pack of 10. 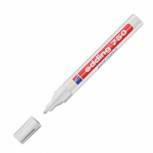 Edding 750 Opaque White Bullet Tip Paint Marker (Pack of 10) 750-049 Pack of 10 Opaque. Lightfast. Waterproof. Heat and weather resistant. For use on most surfaces. Ideal in industry and production. Line width 2-4mm. White. Pack of 10. 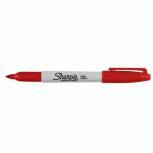 Sharpie Permanent Marker Fine Red (Pack of 12) S0810940 Pack of 12 Sharpie Marker. Pen style marker with a convenient pocket clip and quick drying permanent ink that writes on almost any dry surface. Fine nib gives 1.0mm line width. Colour - Red.